You are here: Home / Blog / Cosmetic Dentistry / Can secondhand smoke provoke dental caries in your children? There are many, many reason to stop smoking and they just keep piling up. 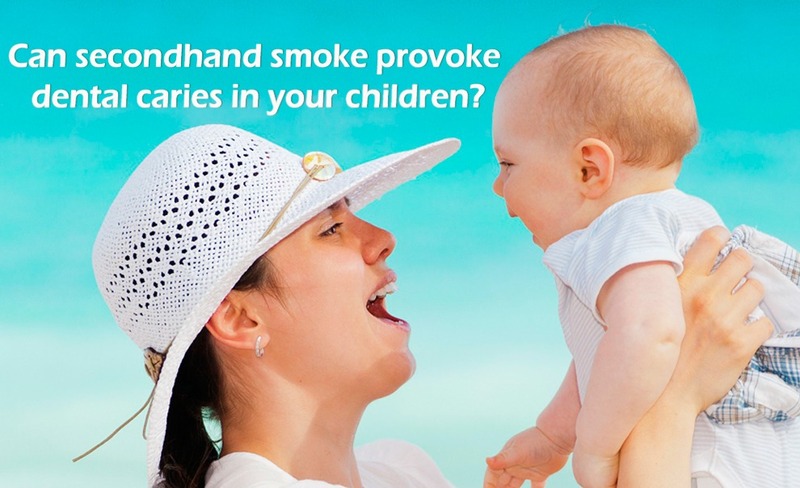 A group of scientist has recently discovered a link between exposure to secondhand smoke to babies of 4 months, trigger or accelerating tooth decay (dental caries) by the time they reach 3 years of age. Although this link doesn’t mean causation, the study raises a few eyebrows. The main problem with baby’s oral health is that many people think that because they have not developed teeth yet they don’t need a dentistry evaluation, resulting in the shocking fact that up to 20% children between 2 and 5 years of age in developed countries suffer from dental caries. The study was done by a team of researchers from Kobe City in Japan where they analyzed dental cases of 76,920 children born between 2004 and 2012 who were monitored from their birth, 4 months, 9 months, 18 months and 3 years of age. The study was done through a questionnaires given to the mothers to assess their habits. As it turns out, 12,729 of the children already had dental caries, and compared to the children without a smoker in the family from 4 months old and before, they showed a twofold increased risk of caries. In any case, this would be one more reason to stop smoking. Smoking can affect your own oral health, making you prone to gum disease, bone recession, dental implant failure and mouth and throat cancer. Is in your best interest to keep you healthy and protecting your smile! Another Happy Patient with our Dentists in Cancun! More patients happy with our dental work!